All stainless steel filter with built-in cyclone separator efficiently removes condensate and impurities from the flow medium, resulting in no moisture droplets and a longer cleaning or replacement cycle. 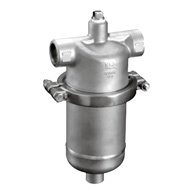 • Separator filter for use on steam and other gasses (non-toxic, non-flammable). 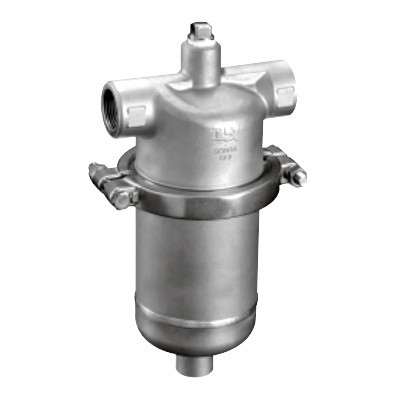 The cyclone separator separates out condensate and dirt, which greatly reduces clogging of the filter and lengthens the time between cleanings and parts' replacement cycles. 5-layer sintered wire mesh filter is reusable and easy to clean. The cyclone separator separates out and removes the condensate, which allows for the supply of dry steam, so no wet spots occur. All stainless steel, with a compact, light-weight design. Equipment related to production in industries such as the food industry, the medical industry and the chemical industry, in which there is direct contact with live steam, such as in steam cleaning equipment and sterilizers.